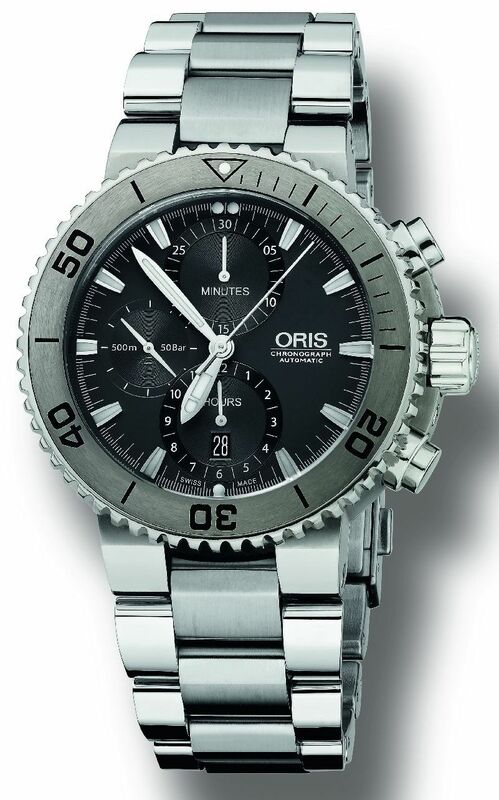 The new Oris Aquis Titan Chronograph is one of the most robust dive watches available, thanks to the combination of titanium and tungsten. This diving watch model features a scratch resistant Tungsten Diver’s inlay.The triangle at zero position, the indexes and watch hands are filled with Superluminova, ensuring the watch face can be easily identified even in bad visibility. The automatic helium valve at 9 o’clock position is essential for professional divers operating from a helium filled diving bell. This well protected time-piece also features a screw down stainless steel crown and stainless steel pushers, solid screw down case back with an engraved conversion scale (feet/meter). A coordinating grey dial and inlay ring ensure the style of the model is in harmony with its endurance. Water resistant to 50 bar/500m and available in a multi-purpose case, the Aquis Titan Chronograph is clearly a watch of substance. • Automatic mechanical movement ETA 7750 with Chronograph function and date at 6 o’clock. • Multi-piece Grade-2-Titanium case construction and crown protection. • Mat grey dial ground, applied indexes filled with Superluminova. • Minute and hour counters with applied rings, polished Nickel hands with Superluminova inlay and polished Nickel hands for the counters. • Tungsten Divers inlay ring with Superluminova inlay. • Screw down stainless steel crown and stainless steel pushers. • Automatic Helium valve at 9 o’clock. • Solid screw down case back with engraved conversion scale (feet/meter). • Multi-piece Titanium metal bracelet with double pushers and extension. • Water resistant to 50 bar/500m.